With over 20 years of experience, Eastbrook Construction has served Howell, MI and the surrounding communities including Brighton, Fenton, Hartland and others. As one of the most experience roof installers in Howell, we know how important details are when planning and installing a roof. Eastbrook Construction’s work ethic is very detailed when it comes to designing and styling a roof to your liking. When building a roof, you have to think about a lot of factors. One of the most important things to research and ask about when having a roof installed are what type of shingles to use. The exterior structure of a house is the first thing people look at before entering. And even a house’s foundation matters. There are many choices when it comes to roofing. with our help we will make the decision making easy and correct for your home. When installing a roof, deciding on what type of things like which shingles to use can be a tough decision. The type and style of roofing may depend on the area you live in, the environment, the pitch, height and more. As most people that live in Michigan and the Howell area know, the weather (rain, wind, snow and ice) can vary as close as 20 miles away! Heck, just north of Brighton and Howell up 23, is a tornado alley with Genesee county reporting the most tornadoes in Michigan. That certainly can weigh into your choice of roofing and shingles. Asphalt shingles are generally the most frequently used because of how inexpensive they are. Even though they’re inexpensive, they may last you 20-30 years. Wood shingles are known for their natural appearance. They are a little bit more expensive than asphalt shingles, but if you were to choose a hardwood, it could last you for about 30-50 years. Metal shingles are becoming fairly popular in many areas of the country, but only look appropriate for homes that have a steep or flat roof. If you choose to have this type of shingle, it could last you for a good 50 years. Tile shingles are some of the most expensive to purchase because of their unique appearance. 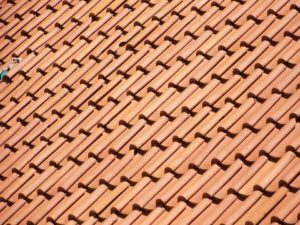 Lasting for more than 50 years, tile shingles are one of the most durable materials on the market. Interested in getting your roof installed? Not a problem! If you’re looking for a roofing contractor to do your new roof installation and live in or near the cities of Fowlerville, Brighton, Hartland and Howell, MI, please contact Eastbrook Construction today to request a free quote! Eastbrook’s dedication goes beyond simple measures. We will work hard until we know you are completely satisfied with the final results. We will make sure you know that you are getting your money’s worth. This entry was posted in Roof installation, Roofing Contractor, Shingles and tagged Experienced roof installers, nearby roof installers, New roofing installation, Roofing contractor near Howell, types of shingles. Bookmark the permalink.